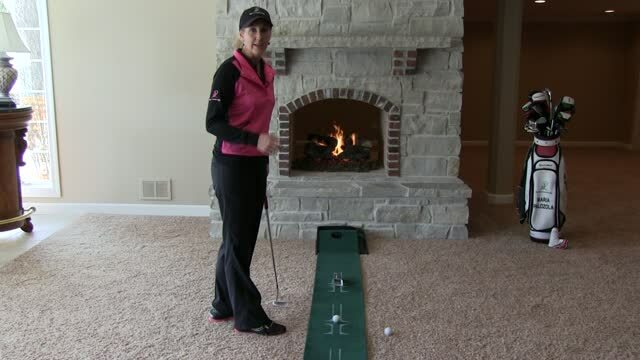 Description: To increase your accuracy on your putts you need to shrink your target. The Putting Box Drill shows you an effective way to do just that. For this drill all you need is a sleeve of balls. Whether you are on carpeting in your house or on wood floors, find an area where you can roll putts of various length. Start with a small putt of only a couple of feet. Set the empty sleeve as your target. Next start rolling putts and try to roll all 3 of the balls back in the sleeve. Once you've gotten your accuracy down, try moving back further and further. Working with this drill helps you narrow your focus with a smaller target. If you become efficient using a small target, the hole will seem enormous and much easier to hit.